Oh Instant Pot, what can’t you do? You can prepare yogurt; you make pretty decent pho; you produce easily peel-able hard-boiled eggs. And now, you connect to the internet. Instant Brands, the company behind the Pot and other Instant appliances, debuted a “smart” version of the multicooker that can connect to wifi. Why would you want this? 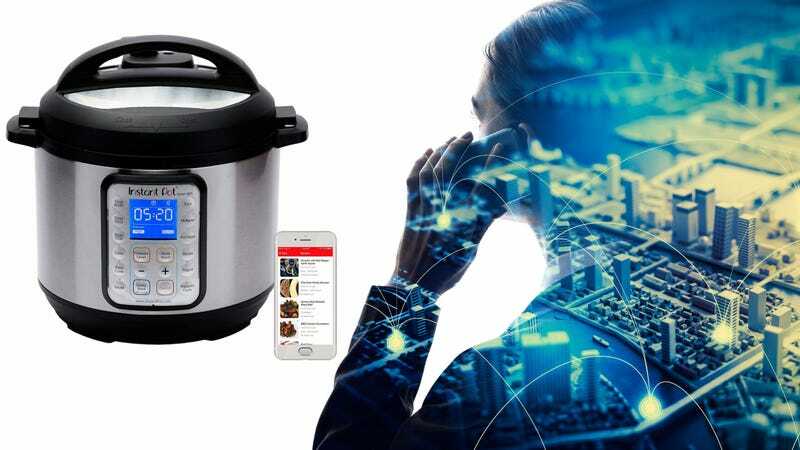 Because the new Smart WiFi Programmable Pressure Cooker connects with the Instant Pot app and allows you to control the device remotely. So if you leave your house in the morning—after setting the slow-cooker function, say—you could turn that slow-cooker down to a lower setting midway through the day without having to run home on your lunch break. Or, you could set the ingredients in your pressure cooker in the morning and turn it on while you’re commuting home from work. The new model also stores 750 Instant Pot-specific recipes, so you can cook specific meals with just one touch. It’s not the first wifi-connected cooking appliance; the Nomiku immersion circulator was an early pioneer in that realm. But this feels sort of like Rosie the robot from The Jetsons—you just press a button before you leave, maybe check in with the app while you’re away, and boom, dinner when you get home. If these are our robot overlords, I welcome them to my dinner with open arms. The Smart WiFi model is available on Amazon now and costs $149.95, which is about $50-$60 more than the standard Instant Pot of the same size. Did the company time this release just before Black Friday and holiday shopping? You know it did.